13 | January | 2019 | A balanced diet . . .
Around the world in 40 years . . . Part 19: O’er the land of the free and the home of the brave! Steph and I really enjoy our visits to the USA. Over the years, we have experienced much of what this beautiful, fascinating, diverse, challenging, often bewildering (to the outsider, at least), and HUGE (or should that be ‘yuge’?) country has to offer. And now that we have family there (our elder daughter Hannah studied in Minnesota, was married there in 2006, and she and her family live in St Paul), there’s an added incentive to visit the USA annually. Since retiring in 2010, we have made some spectacular road trips to explore the country. 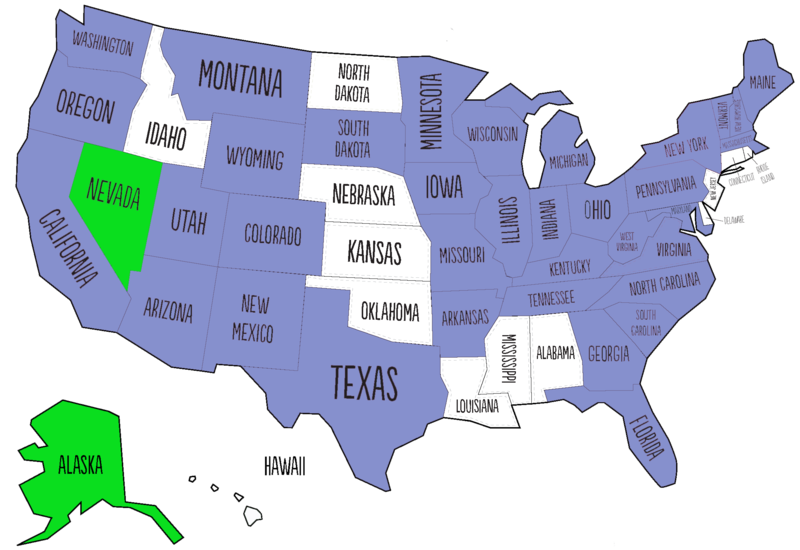 In fact there are now few states (shown in white) that we have not visited, and just two (Nevada and Alaska) where sitting in an airport was as close as I got. Just click the various links below to open earlier blog posts or photo albums. On one flight from Japan to the USA on Delta Airlines, we were diverted to Anchorage, Alaska because of a medical emergency, then spent three hours or so on the tarmac before continuing our journey. In Las Vegas, Nevada we transferred to a domestic flight having arrived from the Philippines. The first time we ever set foot in the USA was in April 1975, but that was only to transfer flights in New York’s JFK airport. Steph and I had left Peru about a week or so earlier on our way back to the UK where I would write and present my PhD thesis at The University of Birmingham later that year. I was working at the International Potato Center (CIP) in Lima, and the center’s Director General, Richard Sawyer, had offered me a postdoctoral position (provided I successfully defended my thesis) and a posting in Central America. So our trip home took us to Costa Rica for about 3-5 days (via an overnight stop in Panama City), a brief stopover of about the same length in Mexico to visit former CIP friends, and then on to New York on an Eastern Airlines Lockheed L-1011 TriStar, the first wide-bodied aircraft we had flown. From New York we took British Airways (on our first Boeing 747) to Manchester. In April 1976 Steph and I moved to Costa Rica and remained there until November 1980. As CIP’s Regional Representative (and potato production specialist), I worked throughout Mexico, Central America, and several countries of the Caribbean. Travel from Costa Rica out to the Caribbean islands (mainly the Dominican Republic, but occasionally other islands where potatoes figured in the agricultural cycle for at least some period of the year) inevitably involved flights through Miami in Florida, and I soon got to know Miami International Airport intimately. Because transit through Miami was a good opportunity to stock up on items we couldn’t readily purchase in Costa Rica, I would always try and schedule my return flights via Miami, arriving there in the early morning and taking the late LACSA flight to San José, giving me several hours for shopping in one of the nearby malls in Dade County. Each year when we flew back to the UK on our annual leave, we took flights via Miami to London. However, the first big challenge of any visit to the USA is actually entering the country. The immigration experience is not always a pleasant or easy one. When traveling in the 1970s, unlike today when we enjoy visa-free ESTA travel (unless Brexit changes that), it was necessary to have a visa to enter the USA, even if only transferring flights, as was frequently the case in Miami. There were no transit facilities. In September 1978, when our elder daughter Hannah was about five months, we traveled to the UK on leave. Things started to go pear-shaped on presentation at the immigration desk in Miami. Although Hannah was registered in Steph’s passport she apparently needed her own visa; Steph’s visa was not good for the both of them. After some intense discussion for perhaps 30 minutes or more, we were finally allowed to enter the USA (and headed straight to a day room in the airport hotel), but with the advice/warning that Hannah’s visa needed to be sorted in London. To cut a long story short, we chanced our arm on the return journey without a visa for Hannah, and I sorted that soon after at the US embassy in San Jose. I had to take six month old Hannah for an ‘interview’ and answer, on her behalf, all the nonsensical questions that one has to answer, about ever being a Communist or a Nazi. I felt like providing sarcastic responses to these, but held my tongue. All babies are communist, right? On another occasion I traveled with a Peruvian colleague, Oscar Hidalgo (who was based in Mexico), to the Dominican Republic, and from there to St Kitts and Barbados, starting our trip in Nicaragua. If memory serves me well, we took a flight operated by the Spanish airline Iberia from Managua to Santo Domingo. So far, so good. But to travel on to St Kitts, we had to transit in San Juan, Puerto Rico. I had a US visa; Oscar did not. Our transit time was about four hours, and although Oscar was eventually permitted to enter the airport, he had an armed guard by his side throughout the whole period, ensuring that he didn’t become an illegal immigrant! In July 1979, I attended the annual meeting of the Potato Association of America in Vancouver, and Steph and Hannah (then 15 months) came along for the ride. Flying from Costa Rica via Guatemala City (a hub for American airline Panamerican in those days), we took a short break of about three days for sight seeing in San Francisco, our first and only visit to that extraordinary city. From Vancouver we drove to Edmonton, then flew down to Madison, Wisconsin where I visited the university for a couple of days, and also the USDA Potato Introduction Station at Sturgeon Bay in Door County alongside Lake Michigan in the northeast of the state. In March 1981, after I had resigned from CIP to return to an academic post in the UK, we flew to New York (on a Lufthansa DC-10), spending three nights there before heading on to London with British Airways. During the 1980s, I visited the USA only once, to attend a scientific conference in St Louis, Missouri, held at the Missouri Botanical Garden in the summer of 1982. This was the first time that I saw the Mississippi River, and also the Missouri a few miles upstream where we had a conference dinner at a restaurant on its southern bank. I had no inkling then that the Mississippi would eventually become a regular feature of our visits to the USA. When we moved to the Philippines in 1991, my work with the International Rice Research Institute (IRRI) took me the USA on a regular basis, to visit the USDA genebank in Fort Collins, Colorado, to attend meetings at the World Bank in Washington, DC (a city I visited many times), or scientific conferences in Seattle (Washington), Minneapolis (Minnesota), Charlotte (North Carolina), Baltimore (Maryland), Stuttgart (Arkansas), and Salt Lake City (Utah). Steph and I also visited old friends in Seattle in May 2000, and toured the Olympic Peninsula with them. L: Sea stack at Ruby Beach on the Pacific coast of the Olympic Peninsula; R: snowfield at Hurricane Ridge on the north of the Olympic Peninsula. When Hannah joined Macalester College in St Paul in the autumn of 1998, I would, as far as possible, route my trips via the Twin Cities, and got to know the area quite well. But it wasn’t until after I had retired that Steph and I really set about exploring the country. Our first road trip in May-June 2011 took us to canyon country in Arizona and New Mexico, beginning in Phoenix, AZ and ending in Albuquerque, NM taking in the Grand Canyon, Monument Valley, Canyon de Chelly, the Painted Desert, and Bandolier National Monument, among a number of locations. A year later we explored the Minnesota Riviera along Lake Superior, and north to the Boundary Waters Wilderness Area. In 2016, after I’d broken my leg in January, we made just a short trip to find the source of the Mississippi in central Minnesota. 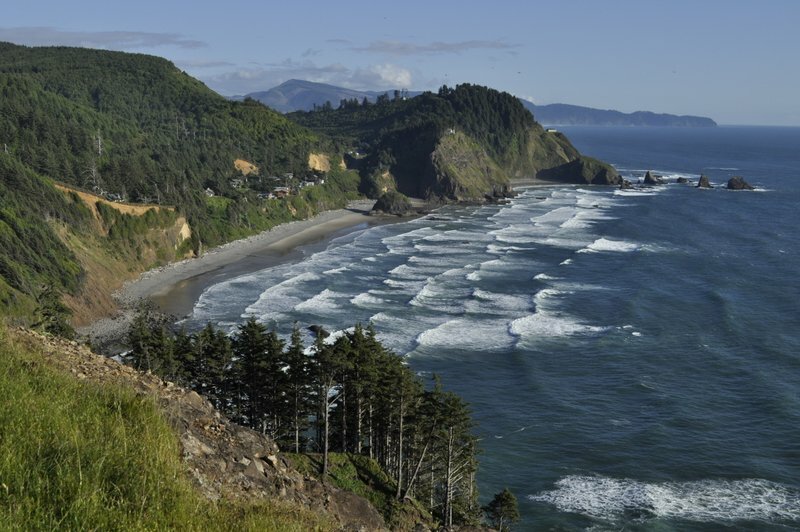 June 2013 saw us on the Oregon coast, spending time with Hannah and family in a house overlooking the spectacular coastline at Oceanside just south of Cape Meares, where the photo below was taken. Then Steph and I headed south into northern California to take in the coastal redwoods. But not before stopping off at Crater Lake, OR. In 2014 we made the first of three road trips of more than 2500 miles. Heading west from St Paul, we took in the Badlands and Mount Rushmore of South Dakota, Devil’s Tower in Wyoming, the Little Bighorn Battlefield in Montana, before heading up the Beartooth Highway (America’s most beautiful?) to enter Yellowstone National Park from the north. 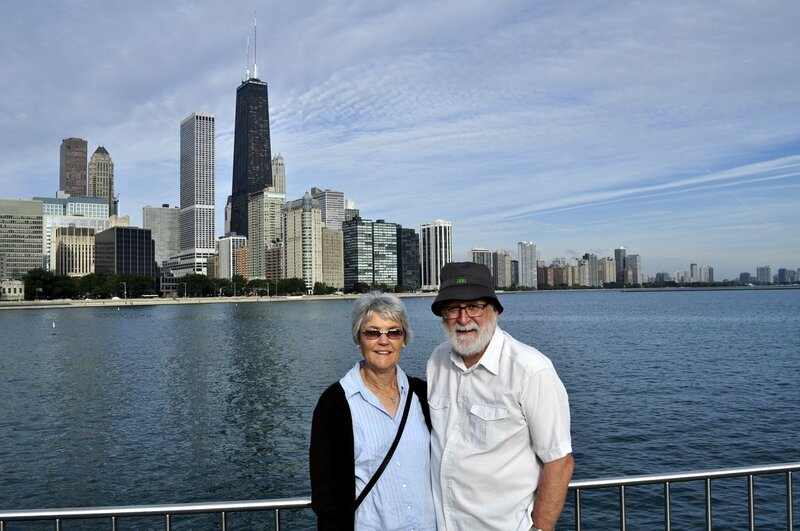 In September 2015, having made a long tour of Scotland in May, we decided on just a mini-break in the Windy City, Chicago, and traveled there by train from St Paul on Amtrak’s Empire Builder. In 2017, we made the long road trip from Atlanta in Georgia to St Paul, taking in eleven states: South Carolina, North Carolina, Tennessee, West Virginia, Virginia, Kentucky, Illinois, Missouri, Iowa, and back into Minnesota. Among the many attractions were the streets and parks of Savannah, the Appalachians, Mammoth Cave National Park in Kentucky, the confluence of the Mississippi and Ohio Rivers, and following the meandering Mississippi north through Illinois, Missouri, and Iowa. That was 2017. Last year we drove from Massachussetts to Minnesota (there is a link to the other four posts in this series), crossing Vermont, New Hampshire, Maine, New York, Pennsylvania, Ohio, Indiana, Michigan, and Wisconsin. So what does 2019 hold in store. We’d like to explore the Deep South: Alabama, Mississippi, and Louisiana, but also taking in Arkansas, Oklahoma, and south as far as San Antonio (and The Alamo) in Texas. But we have no firm plans yet. It all depends on how the UK leaves the European Union (Brexit!) at the end of March, and whether this affects our ability to travel easily. There are so many unknowns, but we are not booking any flights or car rental until the situation is clearer. I think we would fly into Atlanta, and head southwest into Alabama. I’d like to visit Vicksburg in Mississippi (site of an important siege during the American Civil War), and on to New Orleans of course. We wouldn’t try and drive back to Minnesota; it would be too far, so we’ll need to look into flights from San Antonio to MSP. Another consideration is when to travel. Mid-summer would be too hot and humid; not comfortable at all. So I guess it could be in September or early October, but will we come up against the hurricane season? Although I have visited Washington, DC many times, I’ve never really toured the city. Steph hasn’t visited. So a visit there and to Virginia (Williamsburg, Monticello, and Mount Vernon), the Civil War battlefields of Virginia, Pennsylvania (Gettysburg), and Maryland, and the other Atlantic states (Delaware and New Jersey) is another trip we must plan. At the beginning of this post I mentioned that the USA is beautiful, fascinating, diverse, challenging, bewildering, and huge country. From the distances we have traveled there’s no doubt about just how huge the country is; the landscapes go on forever. These landscapes—forests, river valleys, mountains, plains, deserts, and coasts—are stunningly beautiful. In fact, I find it hard to describe them, so will let my photography speak for me. The USA is so many countries rolled into one. The people are so different from one region to another, with very different perspectives on life. And challenging perspectives for me as an outsider, on religion (which plays such an important, and perhaps overly so, role in daily life), the love affair with guns, and the election of someone as President who is clearly not fit to hold that office. A political system that permits a president to be elected although losing the popular vote by 3 million votes or more seems bizarre (not that the first past the post parliamentary constituency system in the UK has much to commend it right now). But it’s the paradoxes of the USA that I find bewildering. We always enjoy returning to Minnesota however, and although we have mostly visited during the summer months, we did experience a Minnesota winter at Christmas 2007. Apart from the winters, Minnesota and Minnesotans are mellow! One last point. If I had to choose to return to just one of places we have visited, which would it be? Without a doubt – the Canyon de Chelly. It was one of the most remarkable places I have ever visited. The closest town is Chinle, and that’s in Navajo Reservation territory. No alcohol in the restaurants, so I’d have to make sure I brought some cold beers along. It was quite a shock when we visited in 2011 and I couldn’t order a beer with my steak.